In February of this year, Roy and I splurged and spent the entire month in our motor home parked at Disney's Fort Wilderness Campground. Although I've never been a Disney fanatic, it was magical! We had a great time taking advantage of all the wonderful amenities this fabulous park has to offer; if you want to see my commentary on our adventures click HERE ! There was just one little wrinkle that invaded our quest to have fun every minute. We were/are trying to sell our existing RV in order to upgrade to another one. (If you would like to peek inside it, click HERE). One evening we got a call from an interested party who said they were flying in the next day to look at it. I got up that morning and cleaned the place so thoroughly that someone could go over it with a Q tip and not find a spec of dust. It was tired and hungry when I finished. Since it was lunchtime and we had a couple of hours to kill before our "showing", I suggested we go to the Trails End restaurant on the grounds. I ordered the fried chicken lollipops which came with coleslaw. They hit the spot which made the phone call we got from our prospective buyer a little easier to swallow; he had gone to look at a RV before ours and had just bought that one. We still have our RV for sale, but at least I got an idea for a blog post! 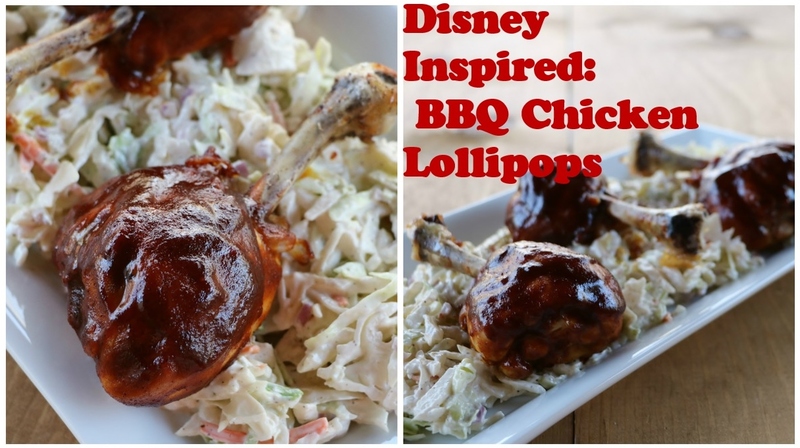 I'm a big kid at heart and I loved the idea of chicken lollipops. Disney's coleslaw had apple and fennel in it, but the version posted here is just my easy, traditional version. I got the BBQ sauce recipe from the Chef Mickey Cookbook sold in the campground Trading Post. Of course any store bought bottle of barbecue sauce would work just as well. Preheat the oven to 425 degrees. Take a very sharp knife and make a cut all around the top of the drumstick leg. Pull off the skin and push the flesh downward to expose as much as the chicken bone as possible. Scrape the top of the leg to remove the skin there. Brush a foil lined baking sheet with oil. Place the chicken legs on it. Brush each leg with oil and sprinkle with salt and pepper. Bake for 25 minutes. Take the chicken out of the oven and slather barbecue sauce all over each leg.Turn the oven down to 375 and bake an additional 10 minutes. Repeat this step one more time. Combine all ingredients in a 2-quart saucepan over medium heat.Bring to a simmer, reduce heat to low and cook for 25 minutes, stirring frequently. Use immediately or store in the refrigerator for up to two weeks. In a large bowl, toss the coleslaw mix with the onion. In a separate bowl, whisk the mayonnaise, vinegar, salt, and pepper together. Pour over the coleslaw mix and gently stir to completely coat. Serve the chicken lollipops on top of the coleslaw. May all your days be magical!